Bangalore-based Kuliza Technologies Pvt Ltd that offers Kuliza, a software development tool for building web, mobile and social media experience for Indian and global companies, has acquired social marketing platform Adepto for an undisclosed amount. If you happen to visit the Adepto site, you will find that it mentions itself as part of Kuliza Digital Offerings. As part of the acquisition, Kuliza has only acquired the Crowdnub platform, while the Adepto team (including Kiran Kumar, CEO, Adepto), has moved on. 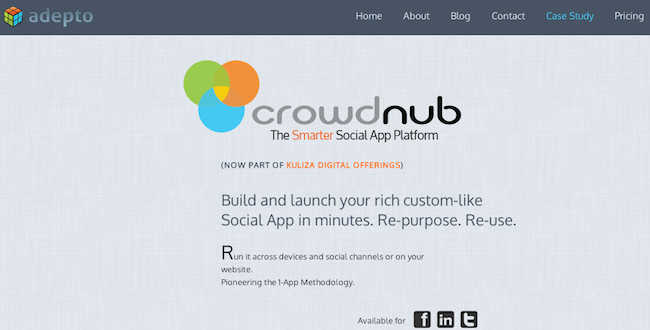 The company has integrated Crowdnub with Mobichirp, a newly launched product by Kuliza that enables brands to build app-like cross platform marketing campaigns. Note that both the companies count Blume Ventures as its investor. Late last month, Blume Ventures had invested an undisclosed amount in Kuliza. At the time, the company had mentioned that the funds will be used for global expansion and marketing. Talking to Techcircle.in, Kaushal Sarda, CEO, Kuliza, had also said that one of the main agendas of associating with Blume Ventures was also to get more of the fund's portfolio companies on board since it has a good mix of technology companies in its portfolio. This deal could be a part of the same. Back in June 2011, Adepto had also raised $300,000 in its Series A round from Blume Ventures and a consortium of angel investors led by Rajiv Dadlani. It also counts the CEO and co-founder of C2W Interactive Group Alok Kejriwal as its strategic advisor. Adepto Solutions Pvt Ltd was founded in 2010 by ex-Google employees Kiran Kumar and Prem Pillai. At Google, Kumar helped set up the direct sales and operations function while Pillai was a programme engineer and handled the application programming interface (API) support for Google Checkout. The Mumbai-based company offers a social marketing platform that can potentially give any brand the power of a bespoke app on a SaaS platform. It allows marketers to update content within the app in a very short span of time and as frequently as desired. It was one of the 13 startups picked for the second batch of Microsoft's acceleration programme in February this year, and was also part of Techcircle.in's list of 10 Indian tech startups that have gone global (the company has presence in both Canada and the US). Kuliza was founded by Anand Kuliza in September 2006. Its product suite includes building online communities, websites, social apps, social campaigns, mobile apps and social plug-ins for brands, while its clientele includes companies like Myntra, Whirlpool, Van Heusen, Intuit and Pearson. This is the second acquisition by Kuliza. In March 2011, it had acquired GizaPage, a Bangalore-based startup that was offering a social platform for brands. Earlier this year, Blume Ventures announced the names of 12 startups it had invested in during the first half of this calendar year (January-June 2013). Of these, the new investee companies were Infollion, Paletly, Voxapp and NowFloats (the fund was the lead investor in all of them).